A professor of philosophy and political science, Scorza teaches fewer courses since he became an associate provost in 2008. Still, he has more than ample opportunities to impact students. His office is responsible for a wide range of key initiatives, from Global Virtual Faculty™ to the Global Issues Gateway Web site, and from study-abroad offerings to U.N.-related programs. “Our goal is to develop programs that allow faculty to internationalize the curriculum and add a global dimension for our students,” he says. Scorza was teaching introductory political science courses when he was asked to help create a new Core course that would introduce students to global issues and also kick-off the nation’s first distance-learning requirement. The course, The Global Challenge, received the Instructional Technology Council (ITC ) award for outstanding online course. 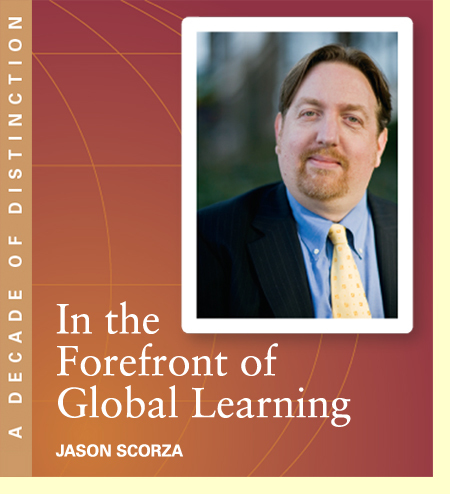 And, Scorza was later honored with the Award for Excellence in Online Teaching and Learning from the Sloan Consortium for his work designing The Global Challenge and another online course, The Life of the Mind. Scorza gravitated toward administrative roles, as a school director and later as associate provost for global learning. “It’s very easy to sit on the sidelines and complain. I wanted to help improve things I had concerns about.” To nurture his administrative skills, he applied for and won an ACE (American Council on Education) Fellowship. He was one of only 39 Fellows selected nationwide for the program, which places promising senior faculty in training opportunities at other institutions. As he was becoming more involved in the University’s global mission, Scorza’s own research interests were likewise moving globally. His focus on citizenship and its related rights, responsibilities and competencies expanded to include the notion of global citizenship. Following the 2007 publication of Strong Liberalism: Habits of Mind for Democratic Citizenship, he is now immersed in two other book projects. The first, tentatively titled Global Education and the American Dream, explores how global learning has often been tied to American ideology. The second, The Cosmopolitans, is a philosophical portrait of cosmopolitans from Diogenes to current thinkers like Kwame Anthony Appiah and Martha Nussbaum. FDU Magazine Online is published twice yearly by the Office of Communications and Marketing, Fairleigh Dickinson University, 1000 River Road, Teaneck, N.J. 07666. For a print copy of FDU Magazine, featuring these and other stories, contact Rebecca Maxon, editor, 201-692-7024 or maxon@fdu.edu.